Dragon. The Asian new year falls at the time of the new Moon in Aquarius each year. 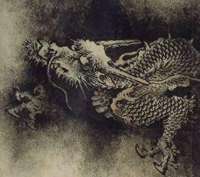 Dragon years have a dynamic and powerful energy, and the dragon is a symbol of the emperor. It also connected with unpredictability, another indicator that we can expect all kinds of wonderful effects and events in 2012. The fact that this is a water dragon year suggests this element will be paramount. We are already seeing a globe struggling with too much and too little water. With the entry of Neptune, the kings of the oceans re-entering watery, Pisces, February 3, we may all need to think about boats and flood insurance. Mars will go retrograde in the sign of Virgo this day as well, allowing us to carefully reconsider what actions we will take in the next few months. Mars only goes retrograde onceevery two years. It will mean that Virgo will be visited by the planet of action and sexuality for four months instead of the usual two. Perhaps it will allow us the opportunity to reconsider aggression as the only way to deal with conflict. Mars retrograde in Virgo slows down and refines our ventures. This may also prove to be a good time to look at issues of self-esteem and how harsh criticism may invade our thoughts, to curtail the pleasure of creative moments, since Virgo can be critical, and Mars in Virgo could encourage self disdain unless it is evolved to the point of ‘crafting’ needed changes. This retrograde period may not be the best time to begin new projects, but Virgo the perfectionist will be glad to suggest new strategies and plans for those endeavors. Mars will trine Mercury at the new Moon, and this furthers the planning, rather than action theme. It could make this a rather confusing day, if Mars is going from direct to retrograde action with a connection to our Mercury, who is the ruler of nervous, mental Virgo. If you need to move ahead with new plans, offer respect to slowness and be patient. The earth element of Virgo (Mars) and Capricorn (Mercury) will mean a well-grounded foundation for what you are attempting to manifest, but it may take some time to appear. The Sabian Symbol for the degree of the new Moon is: A deserter from the Navy. The individual’s self-realization through a crucial repudiation of a collective status which has become unbearable. This new Moon, and entry into the Year of the Dragon, is the perfect opportunity to turn away from the limitations of patterns and social structure, which keep us from evolving into new forms of our potential. The Full Moon of February 7 follows two weeks after the hatching of the water dragon. Saturn will turn retrograde in Libra on this day of greatest lunar manifestation, just as Mars stepped into retrograde on the new Moon. Saturn seems determined to stay in this sign of his exaltation, and will probably also slow down the pace of construction on all kinds of projects, which we have set for ourselves. Relationships will have to be reexamined in the retrograde visit to this sign; justice may have a chance to be reconsidered. This same day, Saturn and Venus, the ruler of Libra will be in an awkward connection to one another, a quincunx. This could be a day of discomfort around relationship, which does not get resolved easily because it has no clear goal. However, the full Moon in Leo may override all of this to celebrate self-expression and dramatic flair. The Sabian Symbol for this full Moon is: A Houseboat Party, the enjoyment of temporary freedom from rigidly structured social behavior, seems to verify that possibility. This image is an interesting follow up to the Navy imagery of the new Moon, and its words of escape from the unexamined acceptance of society’s mores, suggests that individuation has taken place. Both Leo and Aquarius, where the Sun is located have much to do with finding and acting upon the authentic impulses of the individual. Aquarius demands our self-expression in the larger community. We are challenged to be part of the whole without losing our unique gift to that larger organism. Leo is about bringing our gifts and talents out into the open with or without the understanding of the social structure. Leo must lose the ego in the performance, while Aquarius often works without the knowledge of what will enhance the ego. The Sabian Symbol for the Sun in Aquarius is: A Forest Fire Is Being Subdued By The Use Of Water, Chemicals And Sheer Muscular Energy, the individual must use every tool available with a deep faith in his power of indomitability. Despite retrograde Mars and Saturn, this full Moon is the opportunity to continue the struggle to attain some goal or level of competence! This is the Moon of Luis, the Rowan, or Mountain Ash. It is a Moon of change, a period when we begin to feel the growing light, and the power of Bride. Her celebration falls on February 2nd, Imbolc. She is the power of healing, of childbirth and of craft. Her flower is the snow drop who will sturdily bloom through the snow. The Rowan has berries which sustain the birds at this time of year, each have a pentacle on this base, a sign of the protection for those who seek the arms of Bride during this time of quickening. Here are two poems I have written about this sacred turning point in the year. Meet her in the woods when the snow melts in your lungs. She is white from head to toe. Silver rings round her fingers. And she is young and ancient a hag, a mother, a maid. the cold grey eye of the hawk. is already constructed in her heart. with breakfast in mind after long hunger.